Curaçao’s Economy is based on shipping, tourism and oil refining. The total population is 150,000 and speak at least four languages including Dutch as the official language, but English, Spanish are also spoken. Curaçao has nearly perfect weather year-round with temperatures between 70-80° F/23-32° C during the day and 60-70° F/15-27° C at night. The island lies outside the main hurricane belt. October-December is the rainy season, but the rain seldom lasts long. The coolest months are January and February, and the hottest are August and September. The Government of Curaçao, as well as the leading companies, are aiming to make Curaçao a center of e-Business excellence, through investments in all areas of the Island’s technology infrastructure. For e-Commerce companies who establish themselves in these e-Zones a 0% turnover tax and 2% profit tax is applicable, and is exempted from import duties, turnover tax on imported goods. Foreign employees assigned to an E-business enterprise on Curaçao could apply for the current expatriate legislation. This legislation provides wage tax incentives for employees as well as employers. With the introduction of the e-Zone legislation Curaçao can provide important tax incentives for global e-commerce enterprises. Non-residents do not have to pay income tax from income generated from outside the Netherlands Antilles. The 5 islands of the Netherlands Antilles have in principle the same tax laws, although the sales tax on Curaçao and Bonaire is different from the sales tax on St Maarten, Saba and St. Eustatius or Statia. 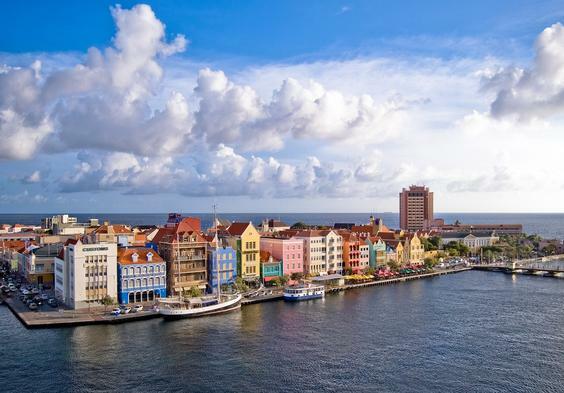 The income/profit tax of residents is levied on the income / profit generated world-wide, while foreign residents are subject to Netherlands Antilles tax if they generate income or profit from Netherlands Antilles sources. The tax system is a so called classical system, which means that a corporation must pay tax on its profit while the shareholder of such corporation must (again) pay tax on dividends received from the corporation. There are however certain facilities that reduce or eliminate this economic double tax effect. Although Aruba and The Netherlands are part of the same Dutch Kingdom and the tax laws have been the same up to the period around the second world war, the tax laws of these three parts of the Kingdom have changed in different directions. The fact that the tax laws originate from the same system makes it possible to have the same judges decide on the tax law disputes. The judges from the Netherlands fly in at least twice a year to settle tax cases. Each part of the Dutch Kingdom has its own right to tax which means that there is also the possibility of double taxation. Already in 1964 the Dutch Kingdom has one Tax Arrangement that solves double taxation issues and arranges for the possibilities to exchange information. This TAK (Tax Arrangement for the Dutch Kingdom) has been amended several times and is at this moment (June 2006) again in discussion on the subject of the dividends paid from the Netherlands to the Netherlands Antilles. The social security system covers on the national level old age (AOV), widows and orphans (AWW) and exceptional medical expenses (AVBZ) and on the employer-level sickness (ZV) and accident insurance (OV). The collection of the taxes and social security contributions is being divided between the Island Collector (EO), the Land Collector (LO) and the Social Security Bank (SVB). – The “penshonado” and his wife may in general not generate income from activities within the Netherlands Antilles unless this income is generated from a company established in the Netherlands Antilles and in which the “penshonado” has a participation of at least 40% or the income is generated from being a supervisory director of a company. The income tax rate applicable on the income of the “penshonado” is 10% and is solely applicable to income from foreign sources (or which is considered to be income from foreign sources according to the income tax law such as interest on bank accounts kept within the Netherlands Antilles). It is also possible to report a fixed income of ANG 500,000 (USD 281,000) at the progressive income tax rate as mentioned above.